Review: 'The Lego Movie 2: The Second Part' Mostly Clicks The guileless Emmet (voiced by Chris Pratt) and the fearless Wyldstyle (voiced by Elizabeth Banks) once again team up to save their extruded-plastic universe in a sequel that, mostly, clicks. Emmet (Chris Pratt) is tasked with bringing peace to the LEGO universe once again in The LEGO Movie 2: The Second Part. 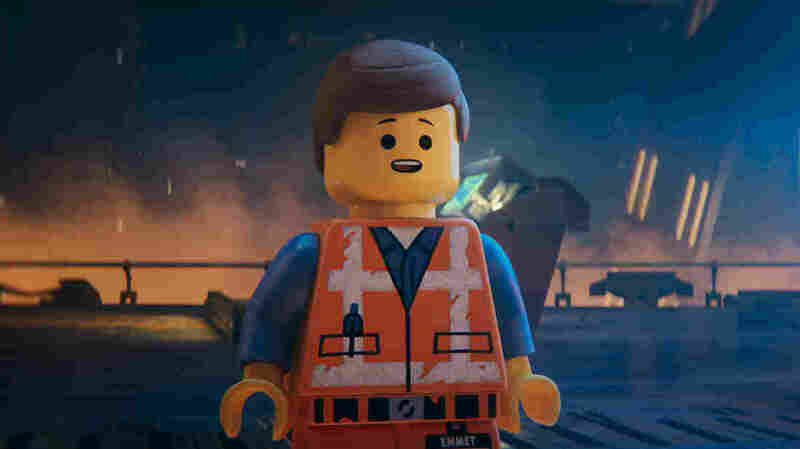 In 2014 The LEGO Movie quickly and efficiently master-built itself in theaters (and in the hearts of critics and audiences alike), surprising anyone expecting a cynical toy-commercial-as-kids'-film by instead delivering a visually inventive, joke-dense and emotionally resonant movie studded with charming performances from a voice cast of beloved comic actors. ... That was also, in the process, a cynical toy-commercial-as-kids'-film. The LEGO Movie's Relevant Numbers: Two directors (Phil Lord and Christopher Miller) and four writers (Lord, Miller, Dan Hageman and Kevin Hageman). That movie established a formula taken up by two subsequent LEGO films in 2017. Both The LEGO Batman Movie and The LEGO Ninjago Movie combined colorful, imaginative action with fusillades of pop-culture gags and — most importantly — Lord/Miller's artisanal humor of rhythmic de-escalation. They'd present a big, familiar genre trapping — the hero delivering their overblown catchphrase with pompous self-satisfaction, say — and immediately have the other characters undercut said trapping with naturalistic dialogue explicitly questioning it ("Seriously?" "That's a stretch." What does that even mean?"). Wait a few minutes, then repeat. The LEGO Batman Movie assiduously adopted this tone and rhythm to lampoon the self-serious, self-important caped loner of the first LEGO film — to great, albeit slightly lesser, effect. The LEGO Ninjago Movie, by riffing on an intellectual property with lesser cultural omnipresence, exposed grievous cracks in the franchise's foundation. The same formula got trotted out — great voice acting, plenty of jokes, the same cyclical comedy of deflation. But something crucial was missing; the result felt strained, labored, desperate and, mostly, written-by-committee. Thus, a pattern of diminishing returns emerges: The LEGO movies work best, or at least most effortlessly, when they feel like loving, hands-on products of individual, idiosyncratic comic minds, not extensions of a brand. Sure, they're studio-produced international blockbusters, and sure, they dutifully bust blocks, but absent the direct involvement of Lord and Miller, these movies feel about as authentic and organic as a series of mass-produced bricks of brightly colored extruded plastic. They look great, but they don't quite ... click. The LEGO Movie 2: The Second Part's Relevant Numbers: One director (Mike Mitchell), three writers (Lord, Miller and Matthew Fogel). Lord and Miller have ceded the director's chair this time out, but they're back pounding out jokes and jamming them into the screenplay so densely that the threat of gravitational collapse hangs over every second of screentime. But they, along with Matthew Fogel, who gets a story credit here, have created a remarkably solid narrative scaffolding that maintains structural integrity throughout. The premise, briefly: We begin where the first LEGO movie left off. Our heroes Emmet (voiced by Chris Pratt), Wyldstyle/Lucy (voiced by Elizabeth Banks), Batman (voiced with gravelly pomposity by Will Arnett) and their LEGO fellows must face down repeated attacks from DUPLO aliens, who wreak their Ages-2-and-Up havoc upon the populace. Soon enough, the threat facing them all is revealed to be shapeshifting DUPLO Queen Watevra Wa'Nabi (say it out loud), voiced by Tiffany Haddish. Several musical numbers ensue, including one painstakingly engineered to embed a bubble-gum pop earworm deep inside your brain. Be warned: It succeeds. Something the first film saved for a last-act reveal — the presence of a live-action, "real" world element that frames the LEGO universe — is foregrounded here, smartly, from the jump. And that device helps The LEGO Movie 2 avoid something that has historically plagued action/science-fiction/superhero blockbusters — the third-act collapse. Remarkably, the film's final section features a clever-but-earned and entirely character-based pivot that serves to deepen and complicate its themes, adding a welcome layer of nuance to the proceedings. That reveal, however, is the one thing that feels legitimately fresh and new about the film, which seems inevitable. While it's technically the direct sequel to 2014's The LEGO Movie, the unignorable presence of LEGO Batman and LEGO Ninjago, two movies that played in precisely its same tonal sandbox, means this latest film can't help but feel like a fourth bite of one very particular apple, not the second. True, the jokes fly at you faster, but sheer familiarity means the laughs come fewer, because as Lord/Miller's once-rare element of surprise has grown steadily more common, its intrinsic, moment-to-moment value has gradually lessened. There's some hope that, as the LEGO Movie brand continues to extend itself (fingers crossed for The LEGO Who's Afraid of Virginia Woolf? Movie, over here) it will evolve beyond its current status as a simple franchise, and become a genre unto itself, because that would open the whole thing up to new possibilities. It could then be tweaked, bent, even wholly subverted in ways that could reinvent the heady rush that first film produced in viewers, instead of merely echoing it.